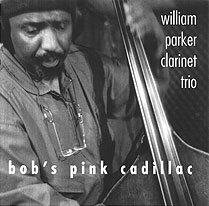 William Parker, bass, gralle, jogibaba, orchestral bells, vocals; Walter Perkins, trap drums, vocals; Perry Robinson, clarinet, ocarina. MTE 32 recorded in January 2001 at Strobe-light Sound, Brooklyn, NY; MTE 33 recorded on 1 August 2001 at Tonic, NYC. Front cover photograph (reproduced above) by Charles Gross. Go to (Abbreviated) list of Eremite Recordings or to list of Independent Record Labels.